Here's one good news to cheer up your weekend. 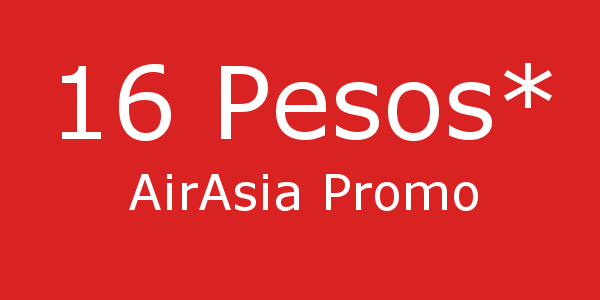 Low-cost airline Air Asia Philippines announced a a new promo offering as low as 16 pesos base fare on select domestic and international destinations. The 16 pesos is actually for flights coming off from Clark International Airport to Kalibo and Davao. But aside from that, there are also other low-cost promo fares. Please see the table below for the complete list. The promo period for this promo is from May 7, 2018 to January 31, 2019. The promo period is from November 13 to 19, 2017. Tickets can be booked from their website AirAsia.com. Note: The amount mentioned above are exclusive of Domestic Passenger Service Charge, Web Admin Fee/Booking Processing Fee and Country Specific Charges/taxes. Here's one thing you can do to be able to increase your chances of finding the cheap ticket you need: be an AirAsia BIG member. It is AirAsia's reward system. It's easy to register, just visit airasia website and click/tap on the login/sign-up link/button. With that, you will be able to book the above promo fares ahead of non-members. Manila or Cebu to Taipei is just 316 and 1290 pesos respectively. This is a very good offer since starting this month, regular Philippine passport holders can now enter the island -state of Taiwan visa-free. According to Taiwanese authorities in Manila, the visa-free policy is under trial until July 31, 2018, which overlaps with the travel period of the promo shown above. Among the places to visit in Taiwan include the Taipei 101, Chiang Kai-shek Memorial Hall, Sun Yat-sen Memorial Hall and National and Revolutionary Martyrs' Shrine. If you find this article helpful, please feel free to hit the share button located above and below this article. Thank you!